At some point in life, many individuals find themselves caring for fragile loved ones: an aging parent, bedridden spouse, child with special needs or sibling with mental illness. Support services have failed to keep up with growing need, and responsibility largely falls on family members. Despite memory-worthy moments of intimacy, caregiving can be time of contradictory, overwhelming emotions that wreak havoc. Caregivers owe it to themselves—and others—to care for themselves. On the one hand, caregivers may be sincerely committed to protecting quality of life for their loved one. But as they submit to a daily treadmill of tasks, interrupted by crises of varying intensity, they may also feel resentful that their own lives have changed. They may harbor anger at other family members who don’t seem to be taking on their fair share of the burden. And then they feel guilty. It’s important to recognize that this ambivalence is a realistic reaction, and simply human. The time demands can be enormous. In addition to medical appointments and other errands, caregivers are often responsible for cooking, cleaning, and intensely personal needs. The loved one may need help showering, dressing, even toileting. Then there are all those medications to keep track of. Caregivers may help pay bills if a parent has outlived their nest egg or a sibling isn’t economically independent. In addition to that financial drain, they may have put their career on hold in order to be on call, jeopardizing their own retirement. In the background, lurk family dynamics. Even if an individual has previously worked through conflicts, the stress of caregiving can trigger old patterns of behavior. Even worse, unaddressed relationship issues can explode. And yet, roles have undeniably shifted. Parents, spouses and siblings may be changing before the caregiver’s eyes, suddenly dependent. They grieve for what’s been lost at the same time that they may fear their new responsibilities. Where can they turn for information about navigating this new territory? What if they make a mistake? Everything seems so high stake. 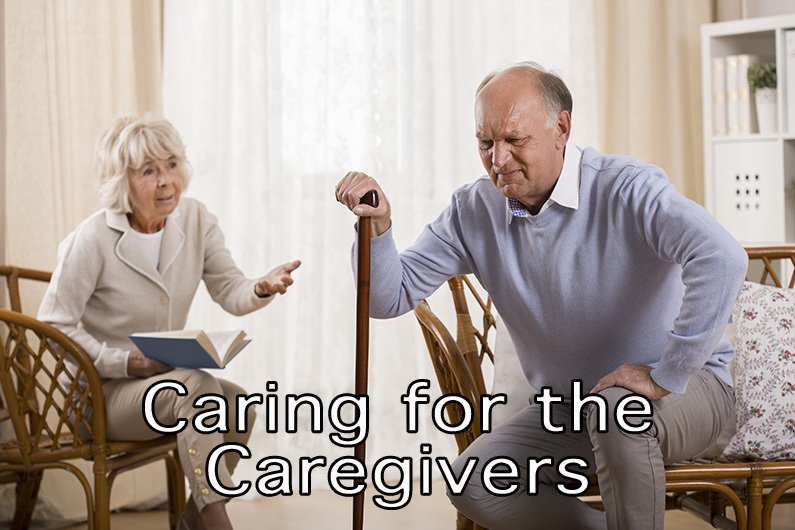 Overcome by their responsibilities, caregivers too often ignore their own needs. As they focus on the other person, they may become socially isolated—at the very time they most need a support network. They can slide into depression, feelings of hopelessness that can erupt into physical symptoms. The risk of substance abuse—smoking, or dependence on alcohol or opioids─ increases. And neglecting themselves can ripple out to affect their professional responsibilities, spouses, children and even their ability to be an effective caregiver. When patients come to me with caregiver burnout, the first step is to create a safe and accepting environment where they can, perhaps for the first time in months or years, begin to think about themselves and their needs. Fearful of being judged for complaining about a loved one who is suffering, many caregivers don’t dare to reveal their true feelings about the hardships they’ve endured, often with hopes and dreams on hold or given up altogether. Once they’ve given themselves permission to speak with me about their experience, many have expressed a great feeling of relief, saying that they don’t feel so alone anymore. This in and of itself offers a sense of hope and possibility. In time, this allows them to rid themselves of guilt and to process their anger, ambivalence or whatever stew of painful feelings they’ve been served. We work on their facing both old conflicts that could be resurfacing and newly emerging ones. We talk about learning to understand and accept what they can and can’t control. How to mourn the loss of the life they wish they had, and perhaps most importantly, mourn the loss of the loved one as they once were. Often, in an ironic twist of fate, relationships change for the better when a loved one falls ill. For example, I worked with a patient who for her whole life had a deeply conflicted and distant relationship with her mother. When her mother developed Alzheimer’s disease, she transformed from a volatile, bitter, emotionally abusive woman into a loving, sweet, person. On the other hand, if a relationship has always been fraught, it may not change. In that case, perhaps some distance from hurtful incidents can be achieved by imagining how a professional caregiver would handle certain situations. I help caregivers identify moments with their loved one that make them smile and will become cherished memories. Because it can be so hard for caregivers to slow down enough to appreciate positive moments, I also help them to be on the lookout for emotional nourishment and acts of kindness from other sources like a loving family member, neighbor or friend. And we wonder together about whether there may be pockets of satisfaction in being able to give back to a loved one who saw them through hard times of their own. Once they begin to feel a bit freer emotionally, I start asking about their physical well-being. How much sleep are they getting? What are their eating patterns? Are they getting any exercise? While I realize that their schedules may be punishing, I encourage them to see the value of caring for themselves, of carving out time for personal enjoyment and healthy habits. If they’re open to it, I can get them started, in my office, with some simple exercises to help relieve stress. We also explore workarounds. Are there others who could stand in for them while they have lunch with a friend? Could a personal aide be hired to carry some of the load? Depending on the individual’s diagnosis, there may be government-paid services to which they’re entitled. I counsel them not to set impossible standards for themselves and to give themselves credit for all that they do. But the biggest takeaway is that it isn’t “wrong” to have conflicting emotions and it’s certainly not selfish to take time to nourish themselves, both emotionally and physically. After all, if they push themselves to exhaustion, those around them will suffer, as well. Their own quality of life matters. Let me know when new episodes and blog posts are up!